I love visitors to the garden. 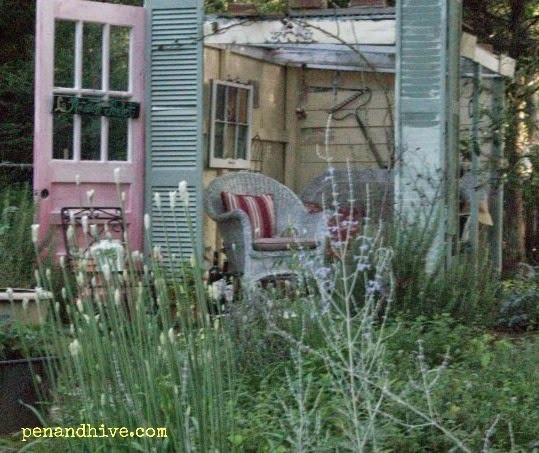 Small children love outdoor spaces like potting sheds where tools and lawn equipment are stored. I didn't realize until later that the Honey Shed might have been a great kid destination as well. Small spaces with unusual things are kid friendly places. The out building I use for storing my beekeeping equipment started out as a playhouse for my daughter. My father in law built it for her and it had a ladder leading up to the fenced in top where she used to march around chanting "I'm the leader." For a lesson in just how accurately small children know what they are supposed to be as adults you can visit her website, Organized Charm. Leadership turned out to be her forte along with organizing the entire world if only people would do what she says. After she outgrew the playhouse parts of it were dismantled and it fell into disrepair as a storage space for a series of lawnmowers. Then a few years ago I dug up a huge part of the backyard to make a garden and decided to reclaim the collapsing building as a garden room. I used clear corrugated plastic as the roof and loved that it allowed light inside. I adore how much like a ruin it looked. The problem was that the plastic roofing material was never water tight and having two sides open to the elements meant that things disintegrated over time. Also putting an old door and shutters out in the garden hastens rot. A few years later my son brought home a carload of windows he'd rescued from someone's trash. The trash picking apple didn't fall far from the tree. I decided I'd use them to make this into a more sturdy structure. The door got incorporated into the back wall and I used scrap to make walls and frame in the windows. I finished it out and added a shelf on the back wall. It still wasn't enclosed in the front. Here's how it looked from the outside. It was still a 3 sided structure though my husband had hired someone to give it a proper roof for me. Last year he hired someone to give it a proper front and a screen door. 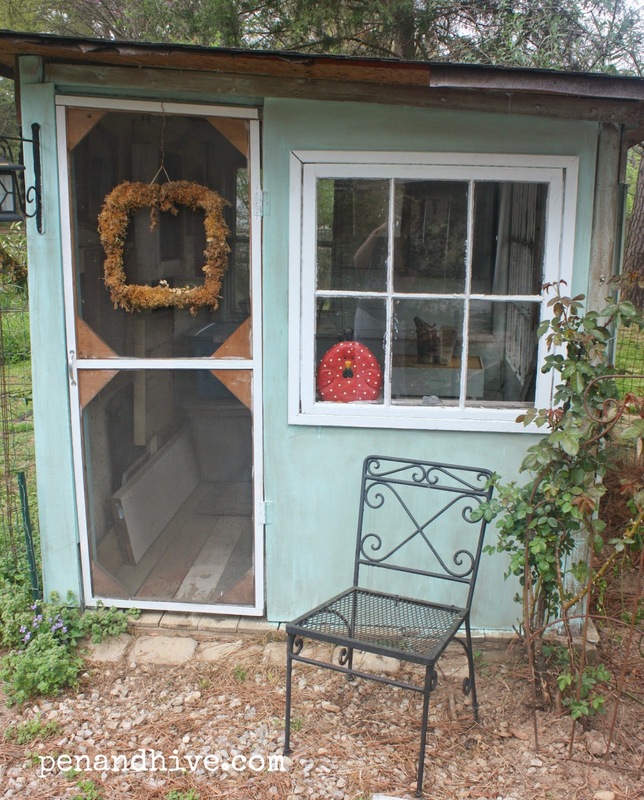 With the front enclosed and a screen door to keep out the chickens and dogs it was becoming much more usable. Everything around here is a work in progress. This structure is now serving as what I call the Honey House. 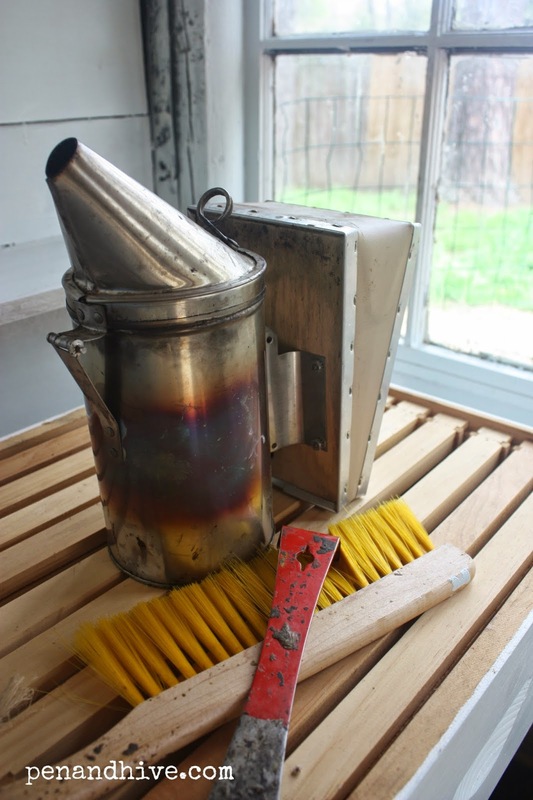 I use it to store all my beekeeping equipment. It is finally finished organized and tidy. The Honey House actually sits inside the chicken run so a cute wooden chicken I picked up years ago at The Hermitage (in Nashville, not St. Petersburg) looks out the window. I see a little more finishing and decorating in its future but for now it's tiny, fun, and useful.